Materials: Jasper, Jet and Burgandy chips. It contains 23.5K Gold Leaf with Quartz and Noble Shungite, Turquoise and Brass shavings; one Labradorite. 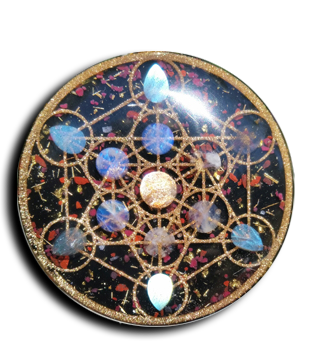 This pendant is cast with crushed Tibetan Quartz and 23.5K Gold Leaf. The detailed geometry is cast in Noble Shungite (which is 99% C60/70 – Fullerenes – Carbon Buckyballs) and a Brass powder with green glow dust. It is inlaid with Turquoise.